comeback. A little dash of fuchsia is wonderful as an accessory, but it begs the question: What is fuchsia, exactly? Our friends at Bergdorf Goodman have roped off a special fuchsia section that muddies the waters even farther. Many of the featured shoes, handbags, and belts are slyly nudged into fuschia nomenclature; witness an electric cyclaman Prada sandal, a violet Dior bag, a salmon clutch, and Dorothy's ruby red stilet tos. 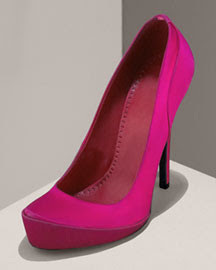 The best item in the collection is the Stella McCartney pump (below). The shoe is the same color as a Dior jacket Style Snatcher purchased in 1991 and very nearl y the color of one of our all-time favorite lipsticks, Christian Dior 475 Tibet. The very fact that Tibet is still being manufactured tells us that fuchsia has never been far from the playing field. In the case of the pump, the color is the best rendition of fuchsia we've seen, but the shoe's forward platform lends the overall design the air of one of those kitschy high-heel shoe chairs you can pair with a molar stool. They claim this type of furniture fits into any decor, but don't believe them. Keep the shoes where they belong, on the pavement, and keep the teeth for biting.